This topic is going to be a challenge to explore cohesively. I have had so many disparate ideas jumbled in my head for a while now, fizzing away & bubbling over. I am going to attempt to put some comprehension around them. Over the past week I have had several conversations that have inspired me to try and make sense of these slightly out-of-reach ideas that haven’t quite fully connected, yet. For the remainder of this month, I am going to put on my future-looking glasses and switch on the dreaming lens. I am going to explore what I want the future to be, and what I am actively doing to influence & shape the future of libraryland. What began as a post reflecting on my journey of finding a mentor has morphed into a different post altogether. I’ve come to realise that I believe more strongly (than I originally thought) that the mentoring of new information professionals is vitally important for the GLAM sectors going forward, whether it is inside the structured framework of a workplace program or under the umbrella of a professional association). 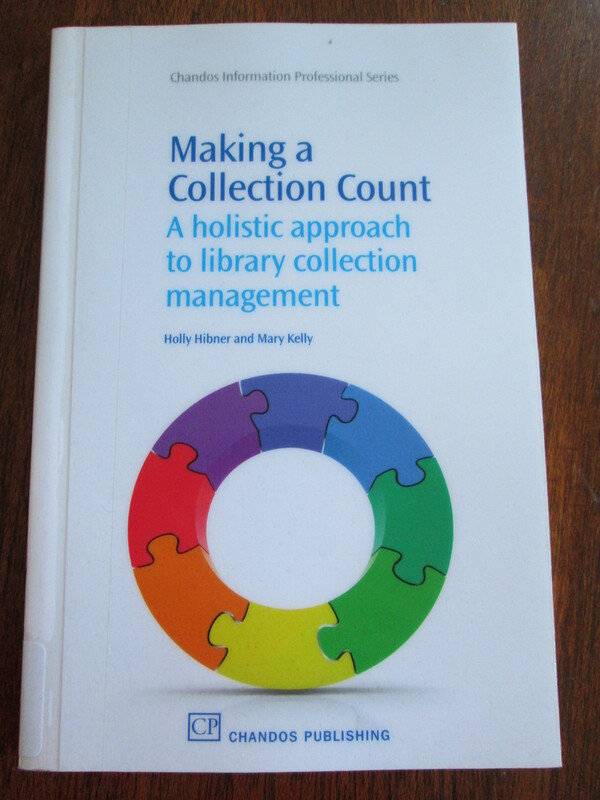 Making a Collection Count : a holistic approach to library collection management by Holly Hibner & Mary Kelly (2010) is one of the clearest & most concise books written on collection management that I have read since I became a librarian. This book is great way to get a handle on how a collection takes shape, what issues may impact on collection development, through to practical explanations of creating policies & measuring performance. It discusses the lifecycle of a collection, outlines collection organisation, how to streamline staff workflows and how to maximise vendor liaison. While it does lean more to discussion of physical collections, most of the ideas can be applied across to digital collections. My aha moment : Chapter 8 : Everything is connected, in which the authors illustrate “how staff impact collections in a holistic library” (p.128). This chapter clearly explains the inter-dependent relationship that all staff (Selectors, Cataloguers, Information Librarians, Library Assistants, Shelvers) have with each other & with their collections. It stresses the importance of sharing knowledge about collections to build greater understanding of how what you do, no matter what your current role, impacts on the information lifecycle. For example, “Selection has perhaps the biggest impact on collection quality because the succes or failure of a library to satisfy its users depends on the materials it makes available” (p. 129). I like the analogy of hopitality that the authors refer to. If you work in a commercial kitchen, you have to understand what your role is in the “whole kitchen” to ensure that the service does not become bottlenecked. Kitchen staff need to understand what others around them do, and how their role relates to other kitchen work stations. I’d recommend this to : a wide-range of Librarians, from LIS students to new staff in Collections teams, as well as using it as discussion book for more experienced Collections staff, to ensure what they think they do actually matches what they are trying to achieve with collections. What if … this book served as a “Staff Book Club” discussion? Everyone in the team reads it, then a facilitator could spark discussion in a Collections team to refine & reframe Collection statements to better reflect #what & #how they do/don’t collect, and #why. What if … your Collections team shared their knowledge with all colleagues using the Collection & Information lifecycles models as a basis for discussion? From answering questions at branch team meetings, to encouraging job shadowing, and by running training sessions.